Microscopic views of copper foam when untreated (left) vs. coated with a polymer called polyacrylamide, which new research has shown can double the conversion of C02 to ethylene. Fossil fuels have long been the precursor to plastic, but new research from the University of Nebraska–Lincoln and European collaborators could help send that era up in smoke — carbon dioxide, to be exact. Nebraska’s Vitaly Alexandrov and colleagues have now detailed a catalyst-based technique that can double the amount of carbon dioxide converted to ethylene, an essential component of the world’s most common plastic, polyethylene. Copper has emerged as the prime candidate for catalyzing chemical reactions that convert carbon dioxide to plastic-forming polymer molecules, which it does when voltage is applied to it. But some copper-based setups have failed to convert more than about 15 percent of CO2 into ethylene, a yield too small to meet the needs of industry. So researchers at Swansea University in Wales decided to try coating copper with different polymers in the hope of increasing that efficiency. After overlaying it with a polymer called polyacrylamide, they found that their copper foam’s conversion rate rose from 13 to 26 percent. 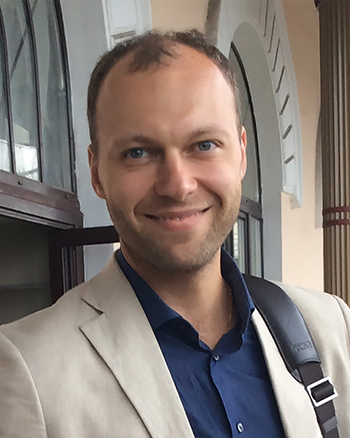 Alexandrov and postdoctoral researcher Konstantin Klyukin then ran quantum mechanics-based simulations through Nebraska’s Holland Computing Center to help explain why polyacrylamide managed to outperform its polymeric cousins. They discovered that the polyacrylamide breaks up CO2 and reassembles it into a pair of bonded C-O compounds, then stabilizes that new molecule as it drives further chemical reactions – those ultimately producing ethylene. Even as researchers look to further improve that efficiency, Alexandrov said, they have an eye toward a larger goal: turning CO2 directly into the polyethylene that makes up plastic bags, containers and films. Alexandrov and Klyukin authored the study with Swansea’s Enrico Andreoli, Sunyhik Ahn, Russell Wakeham, Jennifer Rudd, Aled Lewis and Shirin Alexander, along with Francesco Carla of the European Synchrotron Radiation Facility. The team’s paper appeared in ACS Catalysis, a journal published by the American Chemical Society. The researchers received support from the Engineering and Physical Sciences Research Council and the Welsh Government Sêr Cymru Program.